The Fusion 5 Performance benefits from Kevlar reinforcement. Ideally used by demanding competitors who are not comfortable choosing between performance and durability. 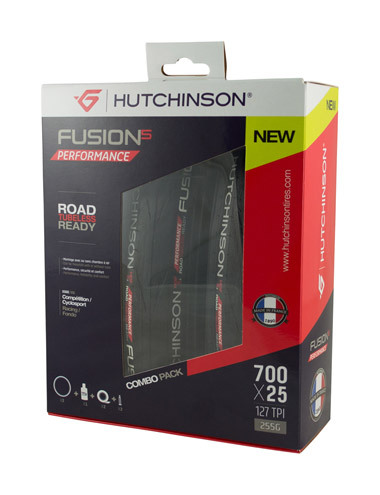 This version of the Fusion 5 combines both seamlessly, still performing at an optimal level but providing greater durability and protection. Road Tubeless Ready: Tubeless "ready road tyre that is used in conjunction with ProtectAir Max latex sealant to make the tyre airtight. Bead to bead sealing reinforcement. 127TPI casing light and resistant. Kit is easy to use. The tyres have been used on my commuting bike for 6 months without a puncture. Package comes with tubeless rim tape, sealant and valve. I didn't expect that. A nice rolling tyre but doesn't seem to be any more puncture resistant than the faster rolling Schwalbe Pro One TL. Good grip and lightweight tyre, very impressed with the tape that was provided with the kit. Installation of this tyre was the easiest Tubeless setup on a road rim I've had so far. I have tried Schwalbe, Panaracer, Vittoria and for an overall score this one is on top. Easy to install, great to ride (comfort, cornering), a bit lower quality of valve ((not fully airtight, a bit of extra glue was needed). I would suggest to add an option to choose from various valves (length) due to various deepness of rims, or information that extension might be needed (to add a proper one to the basket with this purchase. Otherwise, very satisfied. I tried these after I wore out a Schwalbe One in just 2 months. Only done 300k on them so far, but they are clearly more durable (the Schwalbe's were showing signs of wear almost immediately). Great performance and cornering.